Autographa californica nuclear polyhedrosis virus (AcMNPV) is the most commonly used baculovirus for protein expression studies and cell lines derived from S.frugiperda, the fall armyworm, are the most commonly used for its propagation (Cameron et al., Trends in Biotechnology, 7, 66-70, 1989). Conveniently, most of the studies can be performed in biosafety level I laboratories as the virus host range is restricted to a few insect species and it does not propagate in mammalian cells. Advantages also include unprecedented high levels of target protein expression when compared with other higher eucaryotic systems as well as the ability to provide most of the protein modifications essential for target protein activity. This makes the baculovirus system indispensable for producing drug target proteins. For example, over 90% of human protein kinases are produced using recombinant baculoviruses and less then 10% using E.coli. The majority of such protein kinases are inactive if produced in E.coli since they lack the phosphorylation required for activity. Similarly, practically all commercially available steroid receptors are produced using recombinant baculoviruses. Steroid receptors expressed in E.coli are misfolded and are unsuitable for drug screening since the Hsp90 chaperone system is required for their native folding and biological activity. Though E.coli has Hsp90, it is evolutionarily distant from mammalian Hsp90 and cannot facilitate the native folding of mammalian Hsp90-dependent proteins. Due to cost constrains, mammalian protein expression systems are hardly ever used for commercial production of steroid receptors and kinases. Both mammalian and baculovirus system are routinely used for the expression of transmembrane proteins, such as GPCRs, as the overall advantage in expression levels over mammalian only system is less than with other targets (Akermoun et al., Protein Expr Purif. 2005, 44:65-74). The first reports of the use of AcMNPV virus for protein expression were published by Smith et al., Mol Cell Biol., 3: 2156-65, 1983 and Pennock et al., Mol Cell Biol., 4: 399-406, 1984. Originally recombinant baculovirus technology was developed independently in these labs and involved the cumbersome selection of recombinant baculoviruses based on the phenotype of the virus plaques. Only about 1% of the virus progeny obtained after transfection was recombinant. Breakthroughs that made the baculovirus system more accessible to a wider circle of scientists, not necessarily virologists, came in 1993 when two different methods to produce recombinant baculoviruses with high efficiency were independently developed (Kitts and Possee. Biotechniques, 14: 810-7, 1993; Luckow et al., J Virol., 67: 4566-79,1993). The former method serves as a “core” technology for a number of commercial vectors including BaculoGold™ (BD Pharmingen), BacPAK™ (Clontech), ProEasy™ and ProFold™ (AB Vector). Invitrogen’s vectors such as Bac-to-Bac™ are based on the latter technology which involves manipulations with large bacmid DNA in E.coli. Bac-to-Bac™ is an essentially different system not supported by AB Vector and so is not discussed in detail in this chapter. All of the above vectors are similar in a way that target gene is inserted into the polyhedrin site in the baculovirus DNA and its expression is controlled by the polyhedrin promoter, driving the highest possible rate of synthesis of the target protein. The differences are in the methods of construction of recombinant baculoviruses and in purity and stability of obtained recombinant baculovirus stocks. ProEasy™ is the easiest vector that allows obtaining 100% pure and stable recombinant baculovirus stocks. ProFold™ vectors, unlike any other vectors, improve yield of biologically active proteins using molecular chaperones. ProFold™ also differ from other vectors in that they encode GFP marker. Core technology details are illustrated on Fig. 1. Since it is difficult to manipulate the large ~134 kb AcMNPV genome, insertion of a target gene into the genome is performed in two steps. In the first step, a target gene is inserted into the multiple cloning sites (MCS) region of a plasmid vector DNA that can be propagated in E.coli, but not in insect cells. Such a plasmid vector is usually called a “plasmid transfer vector” or “donor plasmid”. The MCS region of this plasmid is flanked by DNA sequences containing the strong baculovirus polyhedrin promoter upstream of the inserted gene and a polyadenylation sequence and an essential baculovirus gene ORF1629 downstream. In the second, "forced recombination" step, a target gene is transferred into baculovirus genomic DNA that was previously digested with Bsu36.I restriction endonuclease at a site in an essential gene sequence close to the site for integration of the insert. As a result of the Bsu36.I cleavage such “linearized” baculovirus DNA is not, in itself, infectious. The linearised genomic DNA is co-transfected into insect cells with plasmid transfer vector DNA containing the insert. Since both DNAs have identical baculovirus DNA sequences derived from the polyhedrin locus, a double recombination event occurs in insect cells restoring the cleaved essential gene and transferring the target gene from the transfer vector into the polyhedrin locus in viral genome at the same time. The resulting circular baculovirus genomic DNA is now infectious and gives rise to only recombinant baculovirus progeny expressing a protein of interest (target protein). The powerful polyhedrin promoter can drive target protein expression level up to 30% of the total cell protein. This version of Bsu36.I –digested baculovirus DNA can produce recombinant baculoviruses with the frequencies approaching 100%, but since it is difficult to digest all DNA molecules, a small amount of non-recombinant baculovirus can also be generated. ProEasy™ technology guarantees that 100% recombinant virus progeny is obtained after transfection. The improvement over the core technology described above is achieved because unlike in core technology (Fig. 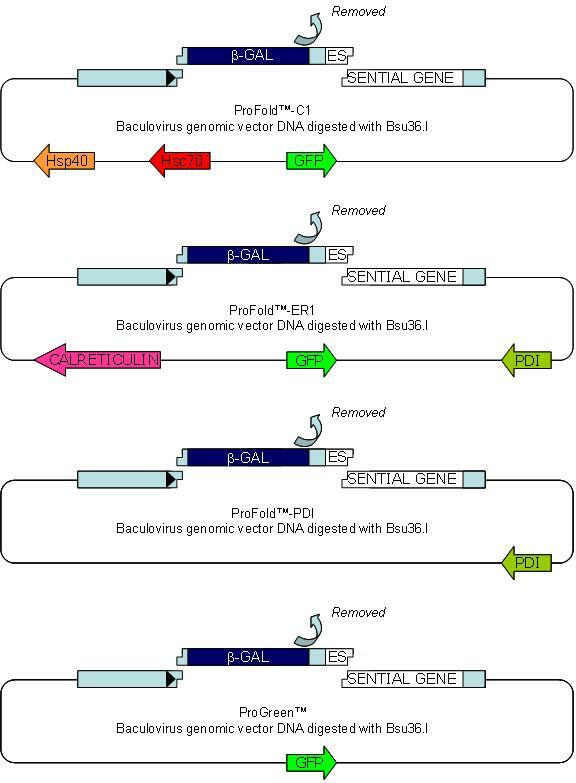 2A) parental ProEasy™ baculovirus DNA contains a lethal gene that does not allow virus replication under the standard conditions used for generation and propagation of recombinant baculoviruses (Fig. 2B). Therefore, any possibility of contamination with parental, non-recombinant baculovirus is eliminated. In the commercially available ProEasy™ DNA (Cat. #A10S) this lethal gene is removed using Bsu36.I restriction endonuclease. As in the core technology, double recombination between linearized ProEasy™ DNA and a plasmid transfer vector with an insert results in generation of recombinant baculoviruses that express target protein at a high level (Fig. 1). Fig. 2. Comparison of core and ProEasy™ technologies. ProEasy™ advantages over other baculovirus systems. For the above described reasons, recombinant baculovirus stocks obtained using BaculoGold™ or BacPAK6™ DNA always contain small amounts of nonrecombinant baculovirus. Therefore, purification of virus stocks by terminal dilution or by plaque-purification is often recommended, especially if a target protein is cytotoxic or if the stock is used for large-scale protein production. In this case a small amount of parental baculovirus could expand in the virus population since it has a selective advantage over a recombinant baculovirus which may propagate less efficiently. However, plaque-purified BaculoGold™ or BacPAK6™ virus stocks are reliable over many passages and trouble-free for continuous use in laboratory practice. Invitrogen’s bacmid-based technologies, in particular Bac-to-Bac™ are often preferred as they facilitate generation of practically 100% of true recombinants after transfection. 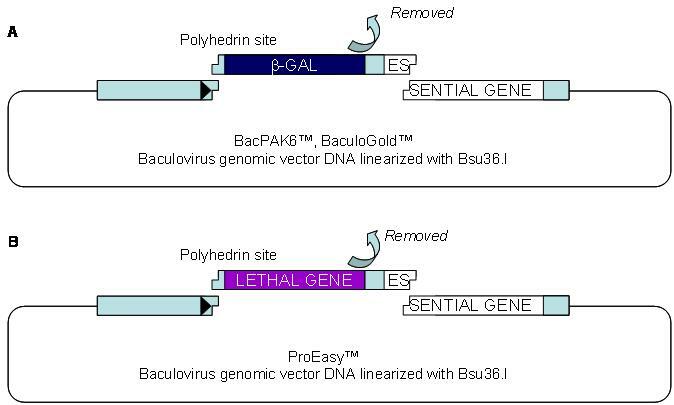 However, due to the presence of transposon sequences, Bac-to-Bac™ recombinants reportedly could be unstable, resulting in the deletion of a gene of interest from a recombinant baculovirus and reduction and eventual loss of recombinant protein expression during virus propagation (Pijlman et al., J. Gen. Virol., 84: 2669-2678, 2003). This effect could be especially pronounced if a target protein is cytotoxic or initially overexpressed. Such stocks cannot be reliably remedied by stock purification, as the recombinant baculovirus is inherently unstable due to the presence of the transposon sequences. ProEasy™ technology is devoid of either of these disadvantages. It facilitates generation of 100% pure and stable recombinant baculovirus stocks. Recombinant baculoviruses obtained using ProEasy™ technology do not contain any genetic elements such as transposons that can cause instability of the recombinant baculoviruses. Furthermore, generation of recombinant baculoviruses using ProEasy™ is more straightforward then using other vectors and involves simple manipulation (Baculovirus tutorial). The transfection reagent (ProFectin™) that is optimized for the vector/transfection reagent pair can be purchased from AB Vector (Cat. #T10, Cat. #T20). A detailed transfection protocol is provided in our convenient Baculovirus tutorial. Recommended plasmid transfer vectors. A large selection of plasmid transfer vectors is available from AB Vector for the use with ProEasy™ baculovirus genomic vector DNA (Fig. 3). All plasmid transfer vectors have the same “backbone” that allows replication of plasmid DNA in E.coli and differ only in the part downstream of the polyhedrin promoter. A target protein can be expressed with either GST, His, GFP, MBP or dual His/ MBP, or FLAG/His tag or expressed without a tag using the pVL1393 plasmid vector. We also offer plasmid transfer vectors with an efficient signal sequence (pAB-bee™, pAB-bee™-8xHis, pAB-bee-FH™) to facilitate expression of secreted and membrane proteins. C terminal tags are optional contingent upon a stop codon at the end of the target gene ORF; to provide an example pAB-bee™ vector is shown twice with the target gene cloned with or without C-terminal His tag. Up to 3 target proteins can be expressed using pAcAB3 vector (not shown). 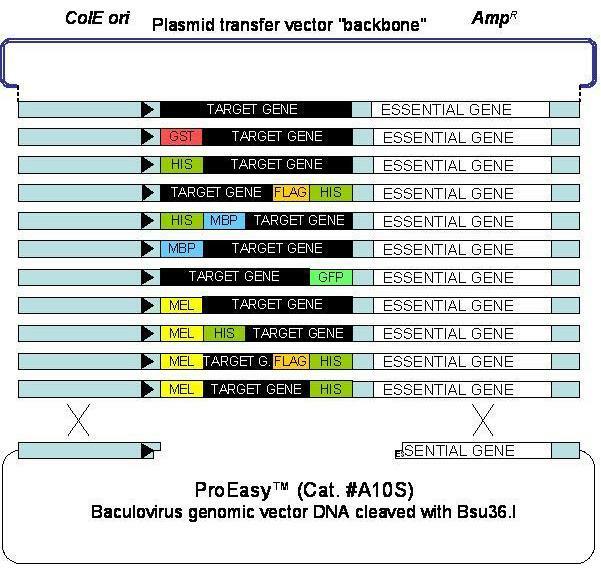 Any plasmid transfer vectors that are compatible with BacPAK6™ and BaculoGold™ vectors are also compatible with ProEasy™ DNA. Fig. 3. Plasmid transfer vectors compatible with ProEasy™. Target gene can be cloned into any of these plasmid vectors and transferred by “forced recombination” into ProEasy™ baculovirus genomic DNA. Click on the vector name link below for detailed information on the vectors. ProFold™ is a patented technology for the simultaneous expression of a target protein and large amounts of human molecular chaperones using the same baculovirus vector. It is available only from AB Vector and its distributors. Using technology proprietary to AB Vector, the genes encoding molecular chaperones have been inserted into the baculovirus DNA backbone leaving the polyhedrin site available for convenient insertion of a gene encoding a target protein. Fig. 4. Schematic representation of ProFold™ vectors. Click on the vector name link below for detailed information. Click on the Cat. # link for pricing and ordering. ProFold™-C1 vector provides human Hsp40 and Hsc70, major cytoplasmic molecular chaperones, at levels comparable with the levels of synthesis of a target protein. Similarly, ProFold™-ER1 provides major endoplasmic reticulum molecular chaperones that facilitate folding of target proteins in the endoplasmic reticulum. Aequorea victoria green fluorescent protein (GFP) is also synthesized by these vectors to facilitate all subsequent manipulations with recombinant baculoviruses. ProFold™-PDI provides protein disulfide isomerase (PDI) to facilitate folding of cysteine-rich proteins but it does not provide the GFP marker. AB Vector’s ProGreen™ vector provides GFP but no molecular chaperones. It is used for a comparison of a target protein specific activity expressed without human molecular chaperones as compared to the same target protein expressed using a ProFold™ vector. All vectors facilitate synthesis of the target proteins at high rates which, depending on the protein, can reach 30% of the total cell protein. Refer to ProFold™-C1, ProFold™-ER1, ProFold™-PDI and ProGreen™ product pages for detailed information. Refer to Baculovirus tutorial for simple step-by-step guidance for the construction of recombinant baculoviruses using ProFold™ vectors. Recommended plasmid transfer vectors. A large selection of plasmid transfer vectors are compatible with ProEasy™ baculovirus genomic vector DNA. The same plasmid transfer vectors as shown on Fig. 3 can be used with ProFold™ and ProGreen™ baculovirus genomic DNA. A target protein can be expressed with either GST, His, GFP, MBP or dual His/ MBP, or FLAG/His tag or expressed without a tag using the pVL1393 plasmid vector. Additionally, we offer vectors with a strong signal sequence (pAB-bee™, pAB-bee™-8xHis, pAB-bee-FH™ plasmid transfer vectors) to facilitate expression of secreted and membrane proteins. Up to 3 target proteins can be expressed using pAcAB3 vector. You can also use any plasmid transfer vectors that are marketed by BD Pharmingen or Clontech which are recommended for BaculoGold™ and BacPAK6™ vectors. Rationale. When a protein emerges from the ribosome, hydrophobic amino acids, which are normally buried in the core of folded globular proteins, are exposed. Similarly, hydrophobic amino acids can be exposed when a protein chain is translocated from the cytoplasm into the lumen of endoplasmic reticulum. The interaction of exposed hydrophobic amino acids in partially folded, newly synthesized, proteins (nascent proteins) results in protein aggregation and the formation of inclusion bodies. Molecular chaperones can prevent protein aggregation by binding to exposed hydrophobic amino acids and can actively fold nascent proteins in a process driven by ATP hydrolysis. However, the chaperones need to be present at comparable concentrations with the newly synthesized proteins in order to ensure that there is enough molecular chaperones to shield all the hydrophobic residues. In any expression system target proteins are synthesized at a much faster rate than in their native environment and could be misfolded if the host cells do not provide sufficient amounts of the required molecular chaperones. For example, in the baculovirus system the polyhedrin promoter, routinely used to express target proteins, drives up to 30% of the total cell protein expression capacity. Misfolding of many chaperone-dependent target proteins is unavoidable as the available insect chaperones are expressed below this level. Misfolded protein is either degraded or forms aggregates that are inaccessible to proteolytic degradation. Usually, both processes take place with either aggregation or degradation prevailing depending upon how quickly the aggregates are formed. In addition, a small amount of correctly folded protein may be synthesized. Contingent upon the prevalence of the process, protein misfolding could manifest in either a very low level of protein expression (misfolded target protein degraded) or very high level of target protein expression, but in the form of inclusion bodies. Though these manifestations are drastically different, the root of the problem is the same, i.e. much higher rate of the target protein synthesis compared to the rate of chaperone synthesis. The problem can be often resolved by overexpressing both target proteins and molecular chaperones using AB Vector’s proprietary ProFold™ vectors (Fig. 5). 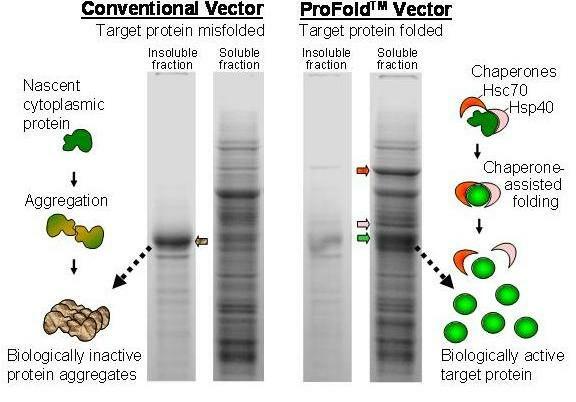 The choice of ProFold™ vector depends upon the nature of the target protein. For example, ProFold™-ER1 drives the synthesis of Calreticulin and Protein Disulfide Isomerase molecular chaperones that facilitate folding of client proteins in the endoplasmic reticulum (Ireland et al., Methods Mol. Biol., 347:331-42, 2006; Maattanen et al., Biochem. Cell Biol., 84: 881-9, 2007; Appenzeller-Herzog and Ellgaard, Biochim Biophys Acta, 1783:535-48, 2008). ProFold™-C1 drives the synthesis of molecular chaperones Hsc70 and Hsp40 that facilitate folding of proteins in the cytoplasm. Here, Hsp40 captures nascent partially unfolded client proteins and presents them to Hsc70. Hsc70 then mediates folding cycles of client protein binding and release that are coupled to conformational change of the chaperone and are driven by ATP hydrolysis (Meimaridou E et al., J. Mol. Endocrinol., 42: 1-9, 2009). Fig. 5. ProFold™ vector improves the yield of soluble biologically active protein. Spodoptera frugiperda Sf9 cells were infected with recombinant baculoviruses expressing a protein of interest using either a conventional baculovirus vector (BacPAK6™) or the ProFold™-C1 vector which overexpresses Hsp40 and Hsc70 molecular chaperones along with the protein of interest. Cells were harvested at 60 h post infection, lysed in 50 mM Tris-HCl pH 8.0, 150 mM NaCl, 0.5% NP-40, and soluble and insoluble fractions were separated by centrifugation at 30,000g for 15 min. Proteins were separated in 11% SDS-PAGE and stained with Coomassie blue. Chaperone-assisted protein folding is widely used in E.coli expression systems to improve the yield and solubility of biologically active proteins (Thomas et al., Appl Biochem Biotechnol., 66: 197-238, 1997; Xu et al., Biotechnol Prog. 21: 1357-65, 2005; Böttcher et al., Appl Microbiol Biotechnol., 73: 1282-9, 2007; Bleimling et al., Protein Expr Purif., Epub ahead of print, 2008). However, even chaperone-supplemented E.coli systems are incapable of providing protein modifications such as target protein phosphorylation, disulfide bond formation and N-linked glycosylation, which are necessary for the biological activity of many eucaryotic proteins, including the majority of drug targets. Recombinant baculovirus system can provide these modifications, and in a number of studies, chaperone-assisted protein folding was successfully applied in the baculovirus system (reviewed in ProFold™-C1 and ProFold™-ER1 product pages). These studies typically involved co-infection of insect cells with several recombinant baculoviruses, one type of recombinant baculovirus expressing a target protein, and other types expressing molecular chaperones (Fig. 6A). 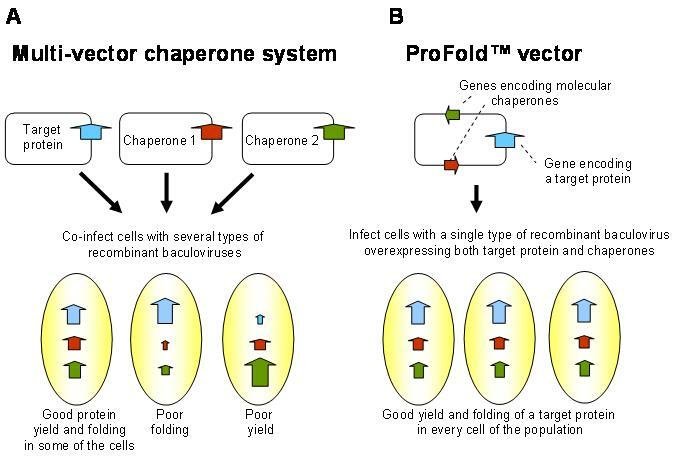 By contrast, using ProFold™ vectors a single genome is used to introduce both the target proteins and a range of molecular chaperones which is more convenient and ensures the correct molar ratios of target and chaperone for optimum activity (Fig. 6B). Fig. 6. Comparison of multi-vector chaperone systems used in prior studies (A) with ProFold™ single vector chaperone system (B). There are additional advantages of ProFold™ vectors over multi-vector systems. First, introducing one vector genome instead of several genomes places less metabolic stress on the host cell resources. About 134 kb recombinant baculovirus genome encodes numerous structural and non-structural virus proteins that are necessary for virus replication and these engage a significant capacity of the cell protein synthesis machinery. Introducing 1 type of recombinant baculovirus (Fig. 6B) instead of several types (Fig. 6A) minimizes this expenditure resulting in overall better expression of both target protein and molecular chaperones. Probably the most important ProFold™ advantage is that all the cells in the population synthesize molecular chaperones and a target protein at the same predetermined rates (Fig. 6B). In the ProFold™ system the rate of the target protein synthesis is close to the maximum achievable in a recombinant baculovirus system for a target protein, while the level of synthesis of molecular chaperones is elevated to the level comparable with the synthesis of a well expressed target protein, but not in a way that would compromise the level of target protein achieved. For example, ProFold™ vectors can synthesize target protein (β-galactosidase was expressed for comparisons with a conventional baculovirus vector as its folding is not chaperone-dependent) at a high level, while simultaneously expressing molecular chaperones to comparable levels (refer to ProFold™-C2 and ProFold™-ER1 protein profiles). This is achieved by separating genes encoding these proteins distal from each other on the baculovirus genome to avoid interference between the strong promoters that control their expression. Cells co-infected with several types of recombinant baculoviruses (Fig. 6A) synthesize target protein and molecular chaperones at different rates, contingent upon how many virus particles of each of the three virus types they receive, resulting in efficient target protein expression and folding only in some cells. This is strongly ill advised and the provision of all interacting proteins using one vector genome rather than using several vectors is much more efficient (Belyaev et al., Gene, 156: 229-233, 1995). Hsp90 is a molecular chaperone that is much more specialized than Hsp70 (Pratt and Toft, Exp Biol Med (Maywood), 228:111-33, 2003). In essence, it is an addition to the Hsp70/Hsp40 protein folding machinery and is required for some proteins to attain their native conformation. While Hsp70 binds to a wide range of nascent proteins that have exposed hydrophobic amino acids, Hsp90 binding is largely restricted to signal transduction proteins that are brought into complex with Hsp90 by multi-protein hsp90/hsp70-based chaperone machinery. Hsp90 client proteins often exhibit uncompromised biological activity only in complex with Hsp90 (Fig. 7). Fig. 7. 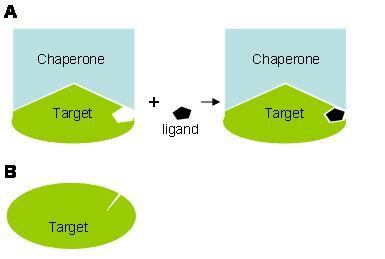 Drug target’s dependence on a molecular chaperone. A. The target is in complex with chaperone that keeps the target’s ligand-binding pocket in the conformation that allows ligand to bind. B. An isolated target has a different protein conformation that either does not allow ligand to bind, or allows it to bind with low affinity. At the same time target may be able to bind with comparable or better affinity to a slew of other compounds that would produce hits during screening, but would have little relevance to in vivo trials. AB Vector has developed a Hsp90 multi-chaperone system that facilitates production of Hsp90 client proteins. In addition, AB vector has developed technology for purification of target proteins in complex with molecular chaperones. Examples of purified target protein-chaperone complexes are shown on Fig. 8. Fig. 8. Purified target protein-chaperone complexes. Ligand-binding domains of the following receptors were produced using Hsp90 multi-chaperone system and purified. AhR- aryl hydrocarbon receptor, major drug toxicity mediator; PXR- pregnane X receptor, major drug-drug interaction target; GR- glucocorticoid receptor, pain, depression, diabetes and obesity target; MR-mineralocorticoid receptor, cardiovascular diseases target; PR- progesterone receptor, breast cancer, uterine fibrosis and endometriosis target target. HER-2- catalytic domain of HER-2 (ErbB2) receptor tyrosine kinase in complex with cdc37 molecular chaperone, major breast cancer target. The Hsp90 molecular chaperone serves as a binding partner that controls the properties of a large number of target proteins, i.e. protein kinases (Caplan et al. Trends Cell Biol. 17:87-92, 2007), steroid/nuclear receptors (Pratt et al. J Biol Chem. 283:22885-9, 2008; Sumanasekera et al. J Biol Chem. 278:4467-73, 2003), Hepatitis B, C, influenza and herpes virus polymerases (Hu J et al. J Virol. 76:269-79, 2002 ; Miyamura T et al. EMBO J. 25:5015-25, 2006, Naito T et al. J Virol. 81:1339-49, 2007; Burch & Weller. J Virol. 79:10740-9, 2005), inflammasome components (Mayor A. et al. Nature Immunology 8:497-503, 2007), eNOS-endothelial nitric oxide synthase (Chatterjee & Catravas. Vascul Pharmacol. 49:134-40, 2008), prostaglandin E synthase (Tanioka et al. Biochem Biophys Res Commun. 303:1018-23, 2003) and telomerase (Elmore et al. Oncol Rep. 20:613-7, 2008). These proteins represent major cancer, diabetes, inflammation, pain, Alzheimer’s, cardiovascular disorders and anti-viral targets and to date they have not been available commercially in the form of the target protein-chaperone complexes necessary for full biological activity. For complete technical information go to PRODUCTS and click on a particular product name, for example ProFold™-C1. A list of baculovirus manuals and suppliers can be found at www.baculovirus.com. Contact us by E-mail info@abvector.com or by Phone 1-866-683-2867 for technical information. BacPAK™ is a trademark of Clontech, BaculoGold™ is a trademark of BD Biosciences, Bac-to-Bac™ is a trademark of Invitrogen.